We are pleased to announce the Third Annual Aisling and Olivia Fun Run and Remembrance Walk. The event will take place Saturday, June 3, 2017 on the track at Mainland High School in Linwood, NJ. It will consist of a 5k walk/run down the bike path starting at 9:15 am and will have an extra special Kid Fun run. 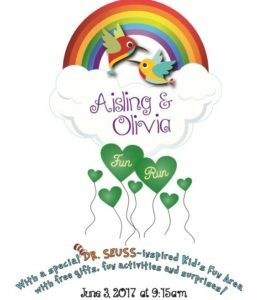 The Aisling and Olivia Fun Run has been established to honor our daughters.